Wisconsin tree care can be tricky. 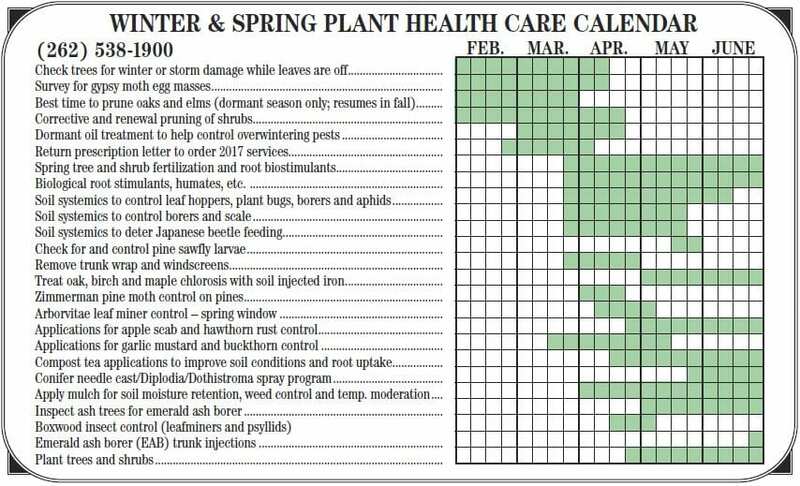 With long winters, drastic weather changes and such a wide variety of plant life and trees, it’s no wonder homeowner’s may find it difficult to stay up to date on plant health care treatments. Luckily, our Certified Arborists have years of combined experience when it comes to treating trees of all kinds. 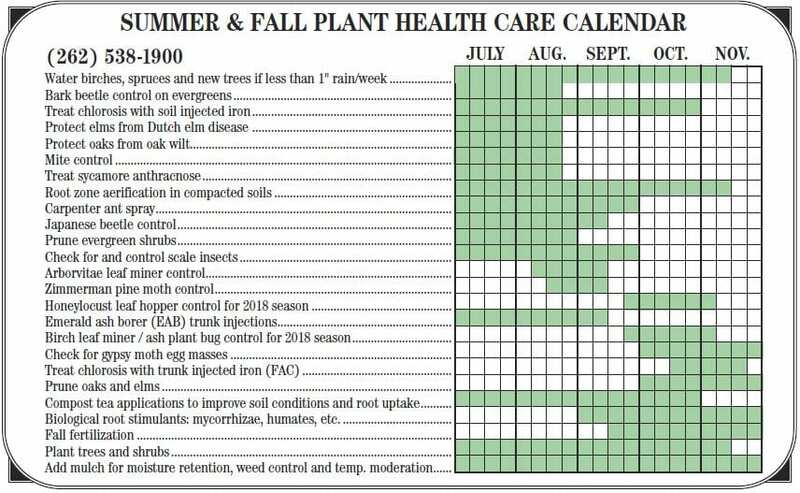 Wachtel’s Tree Care calendar uses a combination of science and professional experience to help you determine the best time to treat your trees. 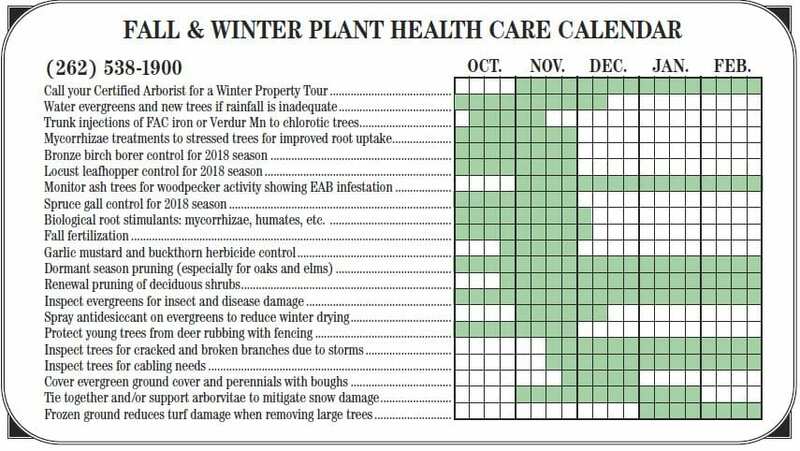 From tree insect control like Emerald Ash Borer treatment to tree disease control like Oak Wilt protection, our Wisconsin tree care calendar will help you stay on top of your tree’s health care needs. Trees should be watered during dry, hot periods when there is no rainfall for two weeks. The equivalent of 1 inch of rain per two weeks is a good guideline. Properly watered trees are healthier and therefore are able to resist pests and diseases better. In addition to watering it is important to look at the leaves of your trees. Problems may exist if the leaves have holes or are shriveling, dropping, turning brown, yellow or exhibiting early fall color. Call your Arborist if these signs appear is the best way to minimize the damage. Trimming your trees (except the Elms & Oaks) is good to do during this time to help prevent damage from storms. Pruning out the dead wood, any broken or hanging branches, and thinning the ends of the branches will help to minimize damage that could occur. Although trees are great additions to your landscape, trees with problems can be liabilities during storms or extreme weather. Fall is a great time prepare your trees and shrubs for winter. Pruning in fall can help protect trees from harsh winter storms so they bloom as vibrant as possible come spring. Once the leaves have fallen and a tree’s branch structure is more visible, the spread of certain disease pathogens or insect infestations is less likely. Most tree problems begin with poor soils, whether from lack of nutrients or other necessary soil components, soil compaction, or amount of acidity, among other factors. Improving your trees soils will help create conditions that are more like those of the forest floor, enabling tree roots to function at their best. When a landscape tree is growing in soil that is well-suited to its needs, it is fortified against pests, disease and environmental stresses. When the leaves have dropped in the fall, it is easier for your arborist to see the structure of your trees. When summer annuals have been removed, there is less risk of disrupting your landscape when working on large trees. When the soil freezes, equipment can often gain closer access, which can enhance our safety and reduce your costs. 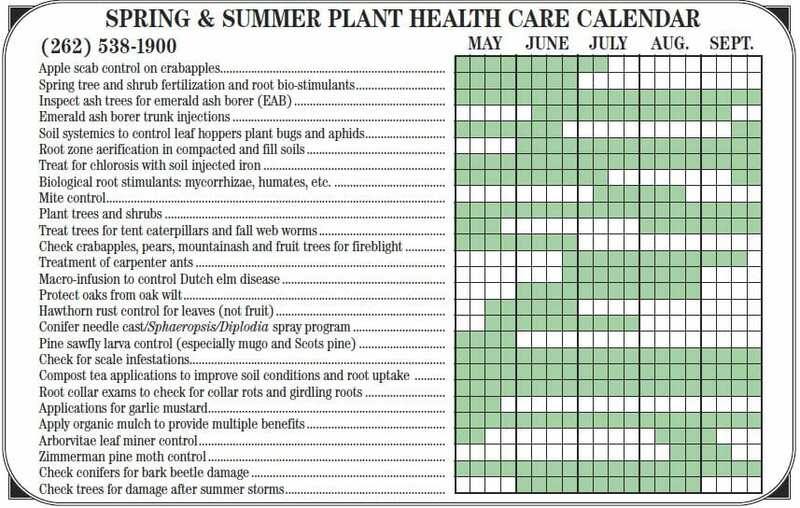 Winter pruning can also avoid enhancing some serious diseases that are active and spread easily during the growing seasons of spring and summer.